So many of our customers have let us know that they just love the way their MooGoo smells. What does MooGoo smell like you ask? Well, that depends on what product you’re referring to and who is doing the smelling. 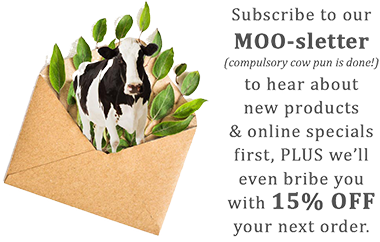 If you’ve ever ordered your MooGoo online, you would probably be familiar with the vanilla smell that comes out of the box when you open it. So yum! Our Milk Shampoo is definitely one of our most popular products and well-known for its smell. And then of course, our first MooGoo product, Skin Milk Udder Cream also has a bit of a famous scent. A few of our other products also have vanilla undertones in them, so we’ve become a bit known for this. We wanted to do something fun and see if we could capture the “MooGoo Smell” in candle form so we could take it home with us and smell it all the time. After lots of testing in the office (and lots of duds), we think we’ve made a good one. This Natural Soy Candle will make any space smell delicious (at least we think so). We only made a small amount for now, but if we find that enough people like it, then we'll keep it around. If you pick one up, we'd love your feedback, so please let us know what you think! All of our wicks are pure cotton and lead-free with burn time of up to 60 hours for the 250g size, and 15 hours for the 50g size. The soy used in the candle is from sustainable sources.